The decision was both easy and difficult. 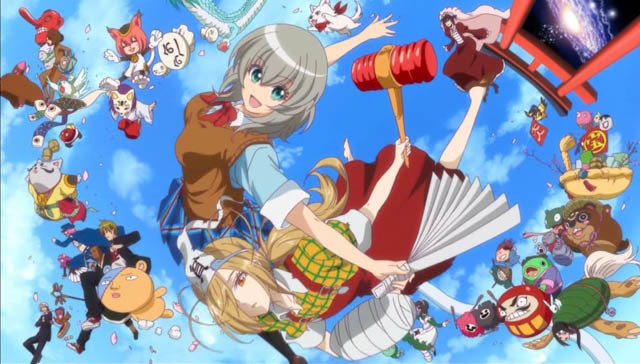 On one hand I had a show that I had partly watched but put on hold, on the other there was a Binbougami ga!. Comedies are often super easy to watch. Lastly, there was Shinsekai yori which may or may not be my thing, but it was 25 episodes long so if I was picking this up I wouldn’t be picking the other two. In the end I went for the two former – Gatchaman Crowds and The God of Poverty. I was a bit surprised Gatchaman Crowds was recommended to me. My MAL list indicates I didn’t find the appeal of Tiger & Bunny, neither of Sentai shows, and much less seen the original Gatchaman. Question was, “would I enjoy Gatchaman Crowds?” But you don’t need to have seen the original Gatchaman as anyone can see this *new* version is much different than the one aired in the 70’s. Going directly to the point, Gatchaman was a mixed experience. I found it to be strangely and gratuitously confusing at times, especially the first episodes. Not to say I didn’t like it. Maybe something was lost in the process between those episodes I put on hold and some information from the original Gatchaman I didn’t get but there were several occasions where I was left with multiple questions about what show was about. Until episode 7-8 I was struggling figuring out what Gatchaman Crowds was really about and who was exactly who and why they were doing what they were doing. 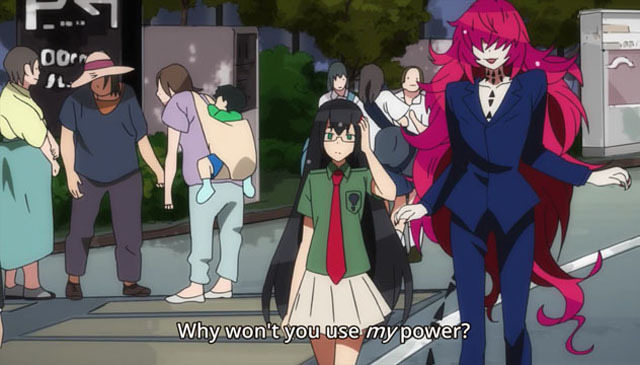 “I thought the Crowds were also the Gatchaman”, “You mean the Crowds are the 100s”, “Why didn’t old man at the Gatchaman HQ ever do anything to fight besides making paper planes and writing obscure messages?” “Why does that girl with glasses keep changing hair colors”, “Why is a floating alien talking to her”, “Why is that insane alien in a suit frenching strangers?” “Why is said alien causing chaos for no apparent reason?” “Why can’t O.D fight like the other Gatchaman?” “Why is so wrong about him spreading his wings?” How is Hajime so upbeat?” “Why is Utsu-tsu always so dreamy?” or why are new Gatchaman led by a baby panda? At one point I wasn’t even sure who was who or what their genders were. Of course, most of the answers to these questions were eventually given but rather than being mysterious and all they were distractions that made an otherwise easy to follow show into a messy hard to follow story many times. I don’t think GC was supposed to be exactly deep or too metaphorically intricate to get. Help the community. We can do it if we all try. Use technology to better society. Say thank you to the mail carrier. Go run a marathon. Rescue a cat stuck in a tree. That sort of thing. But these details and many other sections were also left out to the viewers’ imagination such as O.D’s final fight for example, they quite detracted from the overall experience. But aside from all of this, Gatchaman Crowds was enjoyable to watch (not exactly follow). It is worth noting the star of the show Hajime who carried the show in its entirety, that without that /inexplicably/ constant positivity and classic hyper anime girl mode it wouldn’t have been that much of a success. Maybe the ending was bit too much on the optimistic side to be believable in real life but I get what Gatchaman Crowds was saying. On that note, I checked after finished the anime and there is also a second season coming up. 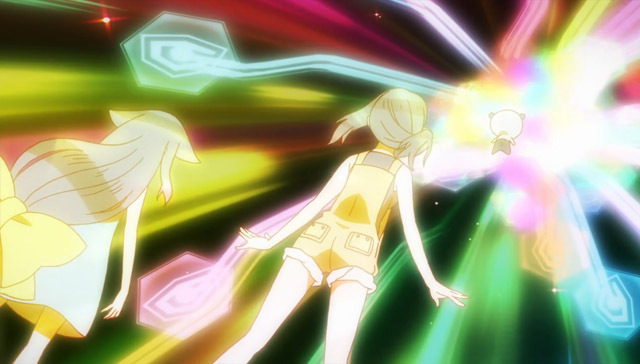 In my opinion, I think Gatchaman Crowds, despite its very open ending, accomplished what it set itself to do. More of it, would probably spoil what it created. All the shows recommended were fairly new so I was familiar with them I just for some reason or another I passed on them. 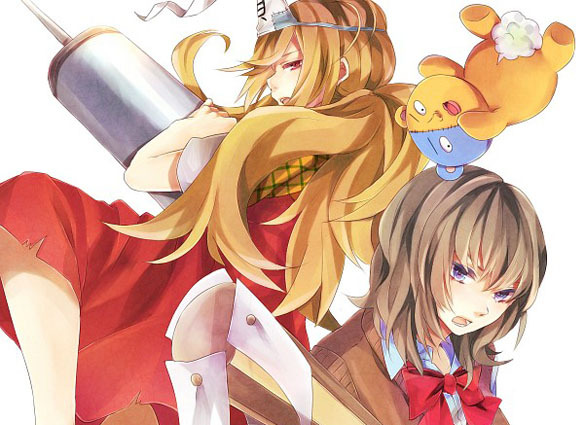 And so I passed on Binbougami ga! for mysterious reasons last year. After actually having watched Binbougami ga! I think I had this show all wrong and regret not picking up back then. The God of Misfortune also was a pleasant surprise. 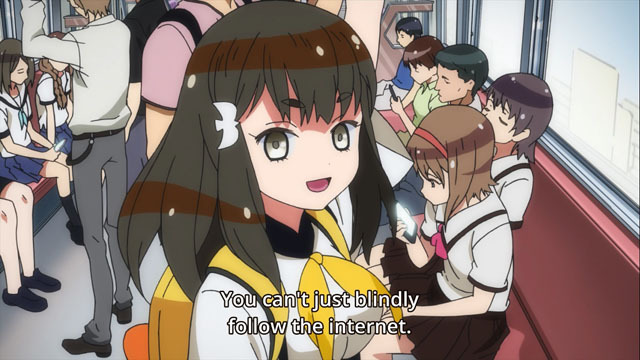 I’d say even more than Gatchaman Crowds. 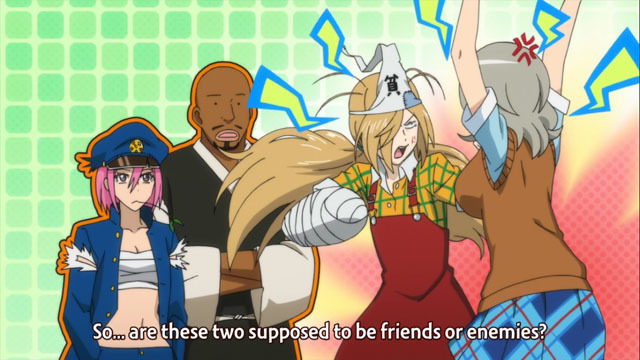 One thing that I liked about Binbougami ga! is that it went for an unconventional approach. Instead of presenting a totally likeable protagonist it brings a selfish, self-centered, haughty, violent and somewhat mental main character named Ichiko. Everyone in the anime seems to be insane. Binbougami ga! has a rather bizarre story. A bizarre cast. Consequently it is also a very bizarre anime. Consequently I happened to liked it. Rich girl hoards most of the luck in the world, insane God of Misfortune and her masochist dog go after her. Chaos and misfortune literally ensues. Binbougami ga like any anime has its strength and weaknesses. It is for better or worse a “reference anime”, which may or may not more than often missed the mark whenever it tried to be one. Unfortunately, there wasn’t much point for any of them so most of them time the show just seemed to make references for no apparent reason as if to meet some imaginary specific anime reference quota. Here is some Lupin reference. Here is some One Piece. Why don’t you have some Doraemon. None of them added much to the show. Yet despite being the 1454545th anime to make a DBZ reference, it did manage to pull off a couple of good anime references. The best example is a fantastically polished elaborate Death Note parody that just fits the scene too well, so damn well that it almost made me think that Binbougami ga! based their character based on Death Note’s after seeing the ridiculous similarities. The way I see Binbougami ga! isn’t that great of a parody show because it isn’t its forte, what it is is an interesting drama+comedy. Eventually I became interested in the ongoing conflicts between Ichiko and Momiji and everyone that got pulled into the craziness more than I expected. It was funny in a different way. Funny, not as much as what they were saying, but what they were doing. Surprisingly it was also comedy that excelled as a drama quite often, at least more often than I’ve seen. But beyond the drama of a mute stuffed bear that can only communicate through a book, beyond the drama of the wandering bald black monk conned to break the law by mammaries, and way beyond the hidden drama of Ichiko’s classmate infatuation with rice balls – there is the personal drama of Sakura Ichiko.The struggle of Ichiko who is supposedly the “luckiest” person alive who despite all appearances is still coping with scars of her past and begins to understand the world like a person, unwittingly little by little making friends of both humans and bipolar deities and sharing her fortune. Binbougami ga! is bizarre, definitely in a good way. Frankly it looks like a show that it would be a blast to see more of. Thank you for the recommendations. 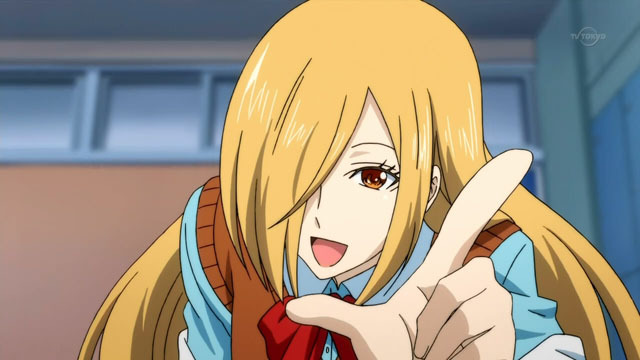 This entry was posted in Commentary and tagged Anime, Binbougami ga, Gatchaman Crowds, secret santa project by keikakudoori. Bookmark the permalink.